There were places that I’ve reviewed with the starting words, ‘I have always wanted to try this place out but a plan never materialised and finally I tried it’ and so on….. I bet I can say that no other place in Chennai would suit those words more than Benjarong does. That’s what happens when almost all your friends have tried it and you don’t have company to go to a place. There are a few must try places in each city and if one hasn’t tried it, it’s a disgrace to call that person a foodie. Well, I guess I can be called one finally now because this place easily tops the list of must try restaurants in our city for any foodie. Songkran, the Thai New Year was the occasion for which I was invited and the chef, Ram Kumar, has designed the menu based on Bangkok’s street food. Given below is my take on the Bangkok Street Food Festival at Benjarong, Alwarpet. Benjarong is located in TTK Road, the second best road for foodies in town after KNK IMHO. Benjarong is bang opposite to the Nike showroom and would be on the left hand side when coming from the Crowne Plaza/Adyar Park end. There isn’t much space in the restaurant’s frontage past a handful of cars but fortunately they have valet parking service, so that’s one issue dealt with perfectly. Benjarong shares the building with Teppan, one of Chennai’s best Japanese restaurants. 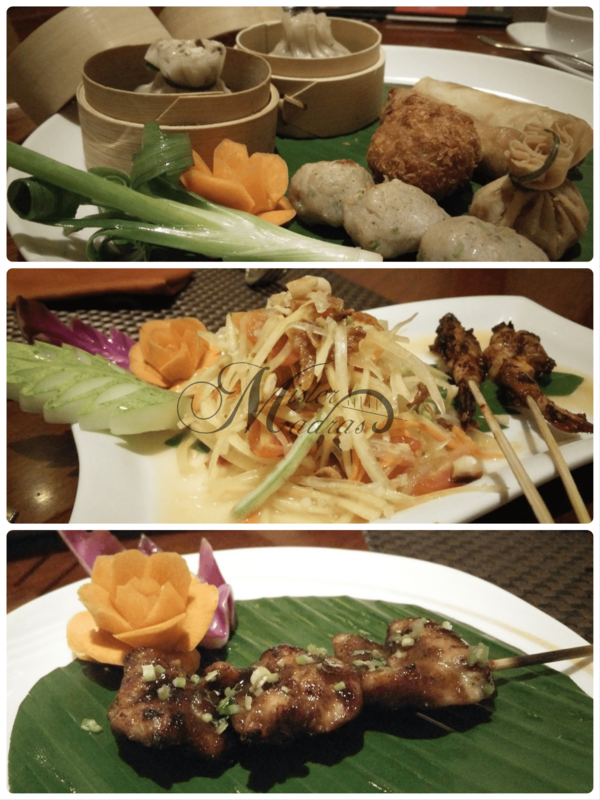 Benjarong’s décor screams fine dining from all corners. The room like segmentations gives a feel that it used to be a house. Aptly lighted interiors with subtle colours and a couple of figurines forms the décor for this restaurant. Owing to a good distance between two tables and the natural serenity of this place, the ambience is perfect for a family dinner or a special evening with an even special someone. It is unsurprising that their menu would be vast enough to cover all segments of a meal. The newly made menu too had a plethora of items to choose from and fortunately, the Chef took care of my orders and aptly got me smaller portions of most of the dishes in the menu. 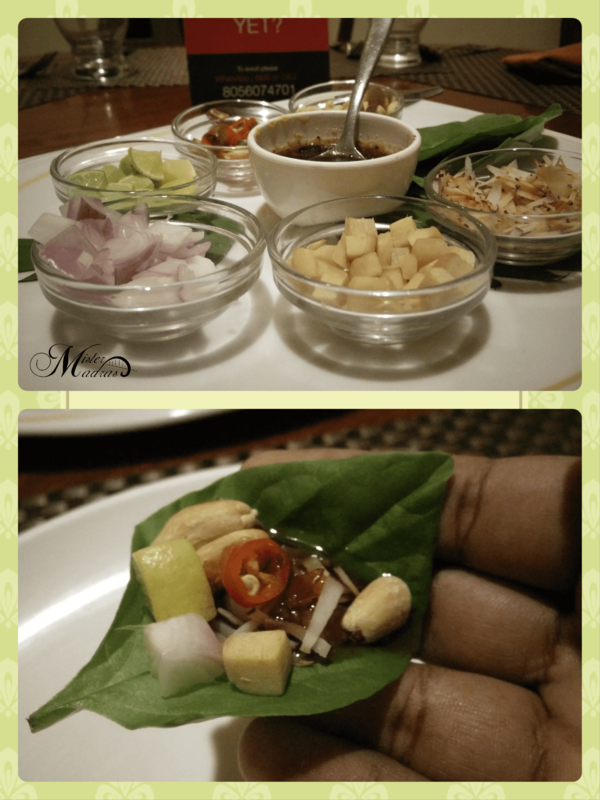 The meal started with the traditional Miang Kham, a dish which consists of green leaves served with a variety of condiments, which in this case was peanuts, sliced red chillies, lime wedges, chopped onions, diced ginger and roasted coconut gratings. As always, it is a perfect kick starter with the mix of all flavours possible. Chaa Yen – Iced tea has never had so much of tea flavour in it before. This classic drink is made from condensed milk with ice cubes to provide the chill factor. The thickness of the condensed milk and subtle sweetness makes this drink something of a substitute for water that can be used during the entire course of the meal and not just as a welcome drink. Since there were quite a number of appetisers and I was all by myself, I got a bite sized portion of almost all of them. Gai Ping – Started the meal with a simple yet delicious starter. Gai Ping is marinated chicken in skewer sticks. The tangy-ness was really spot on and this dish disappeared in no time. Lookchin Pla Yang – Grilled Basa fish balls in a skewer. On its own, the fish flavour with spices was bang on and along with the accompanying sauce, its flavour elevated to a whole new level. Goong Tod Chatuchak – Named after the Chatuchak weekend maket of Bangkok by the chef, this dish has prawns that are panco fried with minced chicken as a layer around it. This was more like the Scottish scotch eggs but with prawn and chicken instead of egg and sausage meat. Served with sweet chilli sauce, not all starters can satiate the cravings of a non veg lover like this one. Poh Pia Sarphan – This is an assortment of spring rolls with four types. I tried the Water Chestnut Pouches and the classic Chicken Spring Roll. They went really well with the sweet chilli and basil based sauce. Thung Nung – Steamed dimsums with mushroom, water chestnuts and tofu as veg option and prawns for the non veg one. Both tasted great but surprisingly I loved the veg one thanks to its crumbly tofu which tasted heavenly with the accompanying sauces. Tom Yum Mama Talay – A local favourite in Bangkok, this is a ready to cook Tom Yum soup with mixed seafood. It was loaded with meat and noodles. One sip of the soup showed its ‘packed food’ nature but it wasn’t unappealing. Actually, it was very delicious. With the noodles and meat it was also pretty filling. This one is quite a soothing soup. Som Tam Goong – I’ve never been a fan of papaya but this papaya salad is actually the most papaya I’ve ever consumed in one go. Completely without the regular repulsive smell and texture I connect papaya with, this salad had fried shrimps as topping and a pair of skewered prawns on the side. I completely loved this salad. Hormok Talay – This one is an interesting dish. Steamed seafood mousse with soft noodles, this dish has the exquisite taste of the ocean which goes perfectly with the plain nooodles. Bamee Pahd Gratiem Prik Daeng Haeng – This dish is a mouthful, both with the name and the dish itself. A basic Thai chilli and garlic noodles. Needs an accompaniment to be better. Tohu Pahd Graprou – Steamed jasmine rice with stir fried bean curd/tofu. As a fan of tofu, I loved this dish thanks to the fact that the tofu pieces are small, which makes them taste better when compared to larger pieces. It’s a dish that doesn’t have a gravy to go with it but it still does the job right. Aitim Khanun Kati – There were four desserts but the chef recommended this dish and it took me only a spoonful of it to realise why. 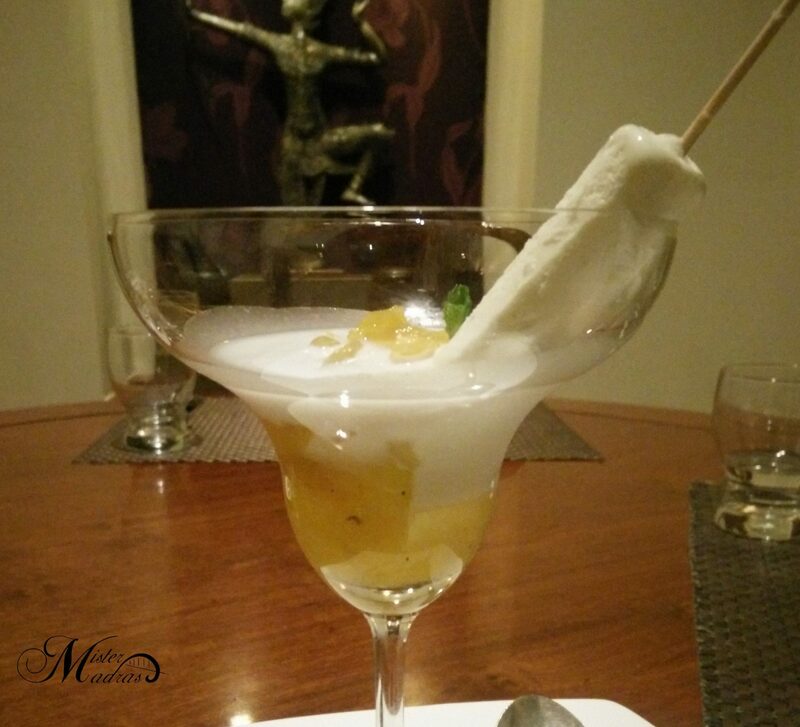 Jackfruit ice cream in a stick dipped in a mix of coconut milk and jackfruit pieces. This dessert was a piece of heaven in each bite and I enjoyed it so much that I licked the mocktail glass on which it was served, clean. Service was commendable. Since the layout is in the shape of rooms, it was hard to get their attention but their service was top notch. A proper meal from this menu would cost somewhere around the Rs. 2000 mark for two people. Street food around the world is usually something that is packed with flavours and even those who aren’t native to that part of the world would generally give it a shot. Similarly, those who aren’t aware of Thai cuisine should definitely try this street food festival and it is sure to not disappoint them. 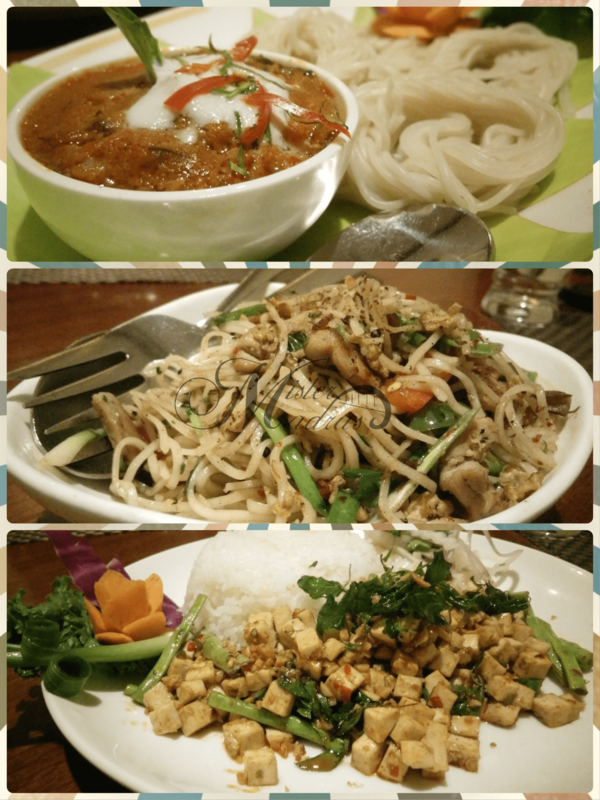 And as a lover of Thai food, I enjoyed my dining experience here and I got to learn a lot about Thai cuisine’s street food culture from the chef who was enthusiastic to share incidents and stories on the country itself and its food. Amazing food, even better company, a dinner like this happens once in a blue moon but I guess I’m just lucky to see that moon often.